Product prices and availability are accurate as of 2019-03-22 06:28:15 EDT and are subject to change. Any price and availability information displayed on http://www.amazon.com/ at the time of purchase will apply to the purchase of this product. 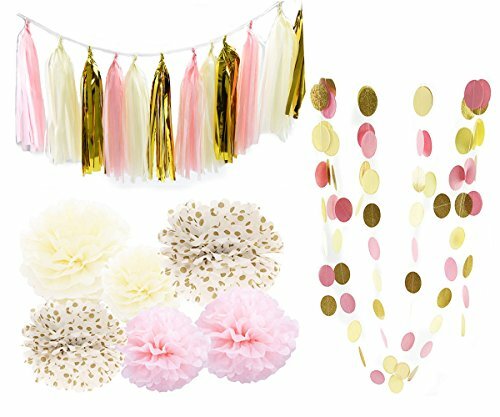 1 pack of pink cream gold mixed color tissue paper tassel with one white ribbon and using instruction,totally 12 sheets,each color comes with 4 pcs. 2pcs glitter gold cream pink mixed color of circle dot paper garland . Paper Garland Length: approximately 6.5 feet. Tissue Paper Craft are so much fun. They appear to float in the air, adding a cheery atmosphere to any event. Perfect for first birthday decoration girl, a rehearsal dinner, birthday party, bridal shower, or casual reception. 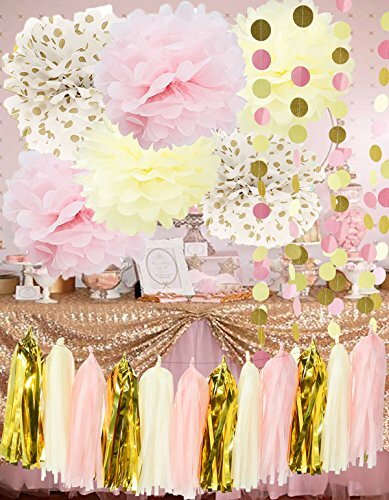 New Release baby pink cream gold circle dot paper garland kit. 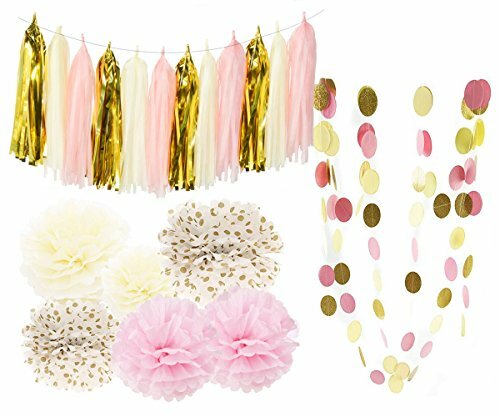 A mixed bright color set that will light your party/wedding/baby shower?pink gold theme party or bridal paper decoration.. Pink and gold decorations package include:6 pcs tissue paper flowers:2 pcs baby pink(1*12inch+1*10inch)+2 pcs cream(1 12inch+1*10inch)+2 pcs Gold Polka Dot Tissue Paper Pom Poms 12inch+1*10inch); 1 pack of pink cream gold mixed color paper tassel with one white ribbon and using instruction,totally 12 sheets,each color comes with 4 pcs. 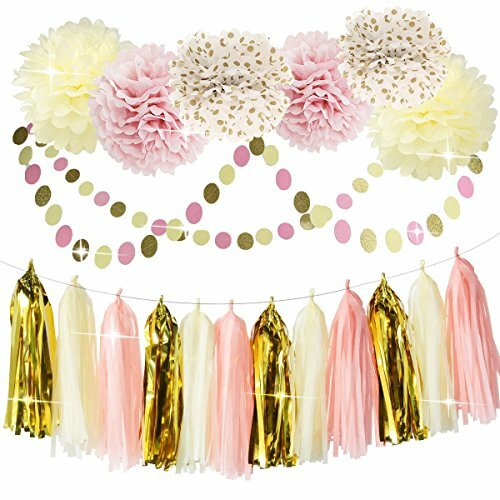 2pcs pink glitter gold cream mixed color of circle garland. Paper Garland Length: approximately 6.5 feet. Tissue Pompom balls paper tassels and Garlands are a wonderful addition to any party and are so versatile! Hang on tables, walls, in doorways or across aisles. They're also fabulous to use as a photography backdrop! Tassel garlands are such versatile, high-impact party decor. They're perfect for jazzing up dessert tables, backdrops, and the overall party space - and mini tassels make a whimsical addition to a centerpiece or floral arrangement. Easy to fold. Ships flat.All in one kit and you can make a fantastic look with all these pompoms tassel garland and polka dot garland. Please note that colors can appear slightly different due to various factors: lighting, monitor, manufacturer batch color variation.